One of early atrocities of the troubles will be commemorated on Sunday when a special sculpture is unveiled in Claudy just outside Londonderry. Nine people, Catholic and Protestant, died when no warning bombs exploded in the centre of the village in July 1972. 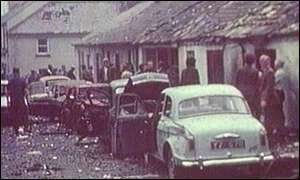 It is widely believed the IRA carried out the attack although the organisation never claimed responsibility. Residents of the village decided to erect a memorial to those killed when three bombs exploded on 31 July 1972. The youngest victim was eight-year-old Katherine Eakin who was cleaning the windows of the family grocery store when the bombs exploded. Joseph Connolly was barely into his teenage years when he lost his life in the bombing. A monument to remember those killed was commissioned because many villagers felt hurt as they thought the atrocity had been forgotten. Sculptor Elizabeth McLaughlin said the memorial was an attempt to find an "expression of the grief of the individual". "Although grief might affect hundreds of people, it is always felt by the individual person." For some the statue will help to open up a discussion in the village about the atrocity. According to Patricia Byrne, whose mother Rose McLaughlin was killed in the bombing, many people in the village remained silent for several years following the blast. "Nine people did lose their lives and I think that should be remembered. It should be talked about. "I don't think it'll necessarily stop anyone doing it again but just for this village I think it's important that those nine people aren't forgotten." She believes that the memorial will help people to mark the atrocity and move on. "For the people around here, for the people of this village, we've had enough. It's time to move on. "We don't want another Claudy or Omagh for that matter." Should there be a public inquiry?